Lorna wanted to make a quilt as a reminder of the Rugby Grand Slam win by Wales in 2012. 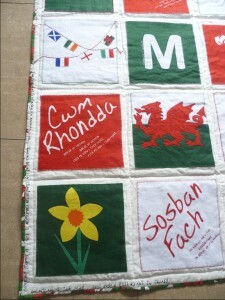 The quilt features symbols, words, and colours linked to the theme. About five minutes into the interview, Lorna talks about how her grandmother taught her how to sew. Later she explains how she uses books and magazines to get ideas and adapts them for her quilts. Liz Savage [LS]: Hello Lorna. LS: Can you tell me about the quilt you’ve got today please? LT: That’s right. The songs that were sung, the daffodils, the flags. Everything that you saw on the day is on the quilt, even down to the score of all the games before and the score on the day. It’s 140cms square, it’s made of a linen top with felt squares and a cotton back of furnishing fabric on the back and it’s got a lovely Welsh flag binding to set it all off. LS: How have you attached the squares? LT: The squares were attached with a blanket stitch. I think I actually sprayed them with this glue to hold them in place and then it makes them easier to stitch. LS: So you didn’t use the fusible? LT: No, because the squares are quite big so I didn’t use that at the time. LS: A lot of it is embroidered, isn’t it, the words. LT: Yes, I’ve appliqued the words, the titles of the songs or the words that you would recognise and then just did a little bit of extra embroidery with the words of a couple of lines to make it obvious what they are. And I’ve got flags on there of all the nations that are involved in the tournament. The only one I couldn’t make was the dragon because he was too small so I had to improvise with a patch. I think that’s about it, really. LT: Everything was… the three feathers I managed to enlarge that on the computer to make a stencil and then I appliquéd that on but I did use like a Bondaweb. LS: Because it’s a smaller area. LT: Yes, smaller little bits and with all the other, the texts for the songs and things, they were all Bondawebbed on to the felt first and then stitched after. It’s not a quilt I would use. It actually stays in the cupboard at the moment. But I wouldn’t get rid of it, it’s just something to keep and it’s something to remember that day and all the excitement and the fun we had. LS: So that’s what you’re going to do with it, you’re going to keep it. LT: I’ll keep it yes. LS: So, would you change anything about it if you did it again? If they won the Grand Slam again would you do another one? LT: I’d have to think of different things to put on there! And I’ve tried to put everything that I could think of at the time so, probably not. LS: Perhaps they won’t anyway [both laugh] Right, let’s… is there anything else you want to say about the quilt? LT: No, I think that’s it. LS: That’s fine. Right, so can we talk about you as a quiltmaker? A patchworker and a quiltmaker. When did you first start making quilts? LT: I first started sewing, I suppose, as a child, with my grandmother. I was still in primary school and she let me help her make things for the sale of work in the church. Whether the things got to the sale of work I don’t know, I don’t think they were that good. But she let me, she encouraged me. And I’ve always done something, stitching, and now it’s only patchwork and quilting that I do, whereas before it was knitting and crochet and all sorts. LS: Did you make clothes for the family as well? LT: I did make clothes for myself, not for the family. I did at one point but I don’t do that anymore. It’s just quilting. LS: Did anybody else in your family sew apart from your grandmother? LT: My mother’s sister, she used to make her own clothes. She went to a college and learnt in evening classes, she made beautiful, beautiful clothes. She always used to bring me the scraps as a child and that’s what I used to fiddle about with. LS: So you were used to using all sorts of fabric then, not just quilting cotton? LT: No, just play with anything. LS: What are your preferred styles? Are you a traditional or contemporary quilter? LT: I think that I am a contemporary quilter. I’m not fond of American block sort of quilts. I understand all the work that goes into them and I can see that you’ve got to have a good talent to be able to make them but they don’t appeal to me the same as something a bit more modern. I like Welsh, traditional Welsh, I’m saying that, I do like Welsh traditional quilts but I think they can look contemporary because they’re a bit, sort of, scrappy and, I don’t know, just because they’re added on to and not sort of so precise then. LS: You often get them with something in the middle and borders all the way round. LT: Yes, I like that sort of idea. LS: What sort of techniques… I can see that you like doing applique so are there techniques? LT: Applique and I’ll put some beads or some buttons, embroidery, what else? LS: What do you enjoy about quiltmaking and piecing, as far as the patchwork goes as well. What do you particularly enjoy? LT: I like the hand stitching when it comes to the quilting. I piece the bits on the machine and that’s enough on the machine, I like to hand stitch then, anything that can be hand stitched I would rather hand stitch. I have made quilts all, completely by hand, you know, the hexagons and things like that but if I can do hand stitching I prefer it. LS: So that implies then that you don’t really want to machine quilt, that’s something you don’t enjoy. LS: OK. Do you use any technology when you make quilts apart from your sewing machine? LT: I’ll use the computer to make templates or photocopying things to make them larger or smaller but that’s about it for technology. LT: I love books, yes. LS: It’ll be your quilt anyway, yeah. That’s the main thing. As far as where you quilt, have you got a room in the house that you use? LT: I have a sewing room now, where I piece, usually I piece the quilt on the machine but for hand stitching, I’ll hand stitch anywhere. I take sewing with me wherever I go. If I go on holidays abroad it comes with me, I just make sure I can take something. Because I couldn’t go without stitching for two weeks in the summer. LS: So that means you quilt every day then, or piece or whatever. LT: Yes, I try to do something every day. If I haven’t I feel like there’s something missing. LS: How do you go about making a quilt? What’s your first thing that you think about? I know this is possibly different for different quilts but when you made this quilt, for instance, the Grand Slam quilt, what was the first thing you thought about? LT: I thought… I’d seen a quilt in a magazine or book that I thought I could develop into a quilt that would lend itself well to having all these different sort of emblems and texts and things on it and then I just sort of made it up as I went along which is really most of the stuff that I do, is make it up as I go along, everything evolves. LS: And how much importance is there with fabric when you start making a quilt? LT: I love fabric. Most quilters probably feel this. Everybody loves fabric. It’s very difficult to choose and it does make a big difference to the end product, I think. So if you choose the right stuff and you like working with it, well, you’ll love doing the quilt. LS: How much time do you spend quiltmaking, say in a week? LT: Oh, I don’t know, too much, too much time and I would sew every day. Maybe some days I’d only sew for an hour then if I’m here, at home, on my own, I could spend all day if I wasn’t uninterrupted. LS: Can we think about what you think about other quilts made by other people that you have seen when you go to a show or when you see people’s quilts in the group that you belong to? What do you look for? 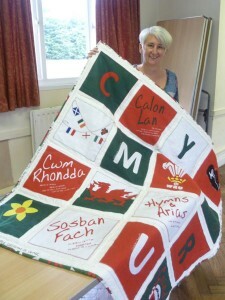 What surprises you, amazes you, pleases you in somebody else’s quilt? 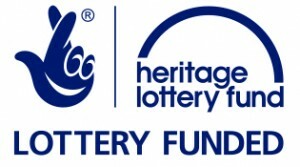 What do you find? LT: I think that’s a difficult question. There are so many different things that could attract you to a quilt. All quilts have got different appealing qualities and it could be like a historical quilt and just the fact that the quilt is still in one piece is amazing and the colours are still vibrant. I think colour and pattern are what attract me to quilts first. Colour probably and then the design maybe after and if there are sort of things that are different, things that I haven’t seen before, that’s what I’m interested in. And you think, where could I use that? LS: Because you feel as if you’re open to new ideas really? LS: Have you ever done the same pattern twice? LS: Because I was asking that because it didn’t sound as if you had! Only once? LT: I made a quilt for my niece when she had her first child and it was an appliqued quilt and I really loved it so I has to do another one for myself. Slightly different but, you know. LS: I don’t think you can count that as being hidebound by… yeah! I think you’ve answered this already really; how do you feel about hand and machine quilting? You don’t really want to machine quilt? LT: No. I would do everything by hand if I could. LS: Let’s go on to what you do with the quilts that you’ve made. What do you do with them? LT: I use some, I’ve got a basket and I’ve got them piled in the basket to use. LS: So you would wrap a quilt around you in the evening sitting down? LT: On the sofa, yes. We’ve always got something wrapped round us. I think that stems back to my father telling us to put a jumper on instead of putting the heating on! Some are in the cupboard, they’ll probably will never be used because they’re not suitable perhaps, like this one, the Grand Slam, it’s more for decoration I suppose. LS: Would you hang it on the wall? LT: In the right situation. Not in my house, no. there isn’t anywhere really where I would put it. If we had the right sort of room, maybe in a boy’s bedroom or something like that maybe it would work, if they were interested in rugby or something. LS: In the same way that they’d have a football poster on their wall? LT: Yes, something like that, yeah. LS: But it’s better than a football? [LT: Yes] Right, before we finish, it’s been great! Is there anything you want to add that we haven’t covered about the quilt or about your life as a quilter? LT: It has been… Since I joined the [LS: The Wednesday…] Wednesday Stitchers I’ve done so much more sewing! I’ve always sewed something or been making something but since going there, you have, you know people are doing things that inspire you to just carry on and do more and more and I think if people join groups like that, they say ‘No I can’t sew’, but people can! You know. They can sew, everybody can sew if they sat down and had somebody to show them, start them off in the right direction. And I think if there were more groups like that it would be a good thing. LS: In different areas, sort of thing, because I don’t think there’s anything further up in the valley, is there? LT: No, but I know my sister-in-law was trying to go to a class, I think it was in Aberdare, and they couldn’t get enough people to go to it, so it never got off the ground. So that’s a shame, really. LS: Right, then, so I think you’ve answered this question, Lorna, but I’ll ask it anyway. 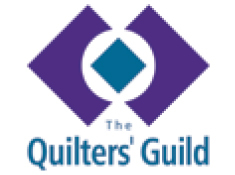 Why is quiltmaking important in your life? LT: I suppose you could say it keeps you sane! [Both laugh] It is relaxing and I’ll just sit and stitch and I’ll be thinking of things that I, you know, should be doing. Things come into my head that perhaps I’d forgotten about, that I should have done. I just think it makes you sit and think as well when you’re stitching. Because it’s not complicated, you know, just hand stitching, it’s relaxing and it does you good, lowers your blood pressure I should imagine. LS: I should imagine. Well thank you very much, Lorna, that was lovely. 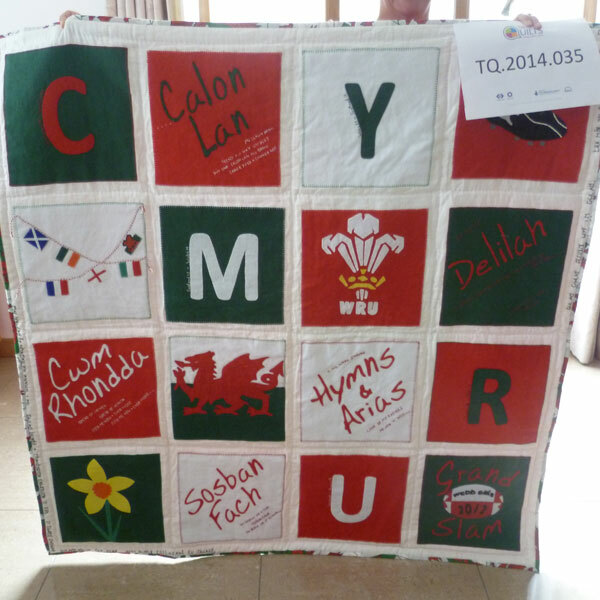 Thank you for contributing to the Talking Quilts project.